We now have a lesson plan to go along with Atrocious Poems A To Z and several schools, church groups, and literaacy organizations are interested already. It's extremely gratifying to to know people are enjoying the book and think of it as a learning tool. 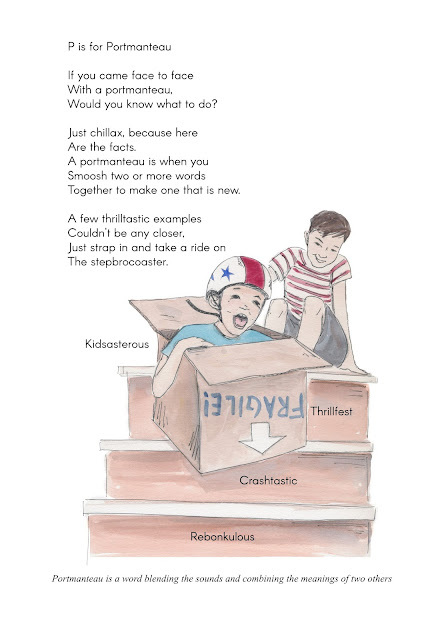 P Is For Portmanteau was one of my favorite poems to write for the book. In the end, I needed to simplify this poem quite a bit because my original conception was far too ambitious. I wanted to combine elements of portmanteau and chimera in a poem that would take place at a zoo. It was far too much for the 12-15 lines I had allotted myself, but I had it up on my wall for over five years trying to force it into existence. In the end just not biting off more than I could chew was the solution. Jenny came up with the portmanteus she illustrated on the stairs. Aw, it is so cute and innovative way to teach kids new vocabulary and also makes the experience a fun one. Please share other poems as well.